"I was very surprised when I saw her being recognised as the winner yet I didn't see any female athlete in front of me. 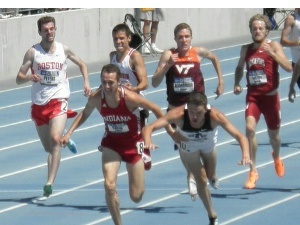 It is a case of indiscipline from a runner. ... There is no way a winner can get into the stadium without the crowd noticing her presence but I'm very happy the organisers solved the issue as soon as possible." - Standard Chartered Nairobi International Marathon champion Winfridah Kwamboka talking about having the honor of breaking the finishing tape stolen from her at yesterday's race. The culprit, Selina Ariong'onyang, wouldn't confess, though, saying, "I am the winner and what has happened here today is demoralising, could it be because I come from a marginalized area?" 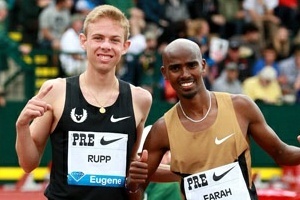 Do you think Alberto would be competitive with the Kenyans if he was a young runner today??? Mayors Cup - Wrong way, what happened? 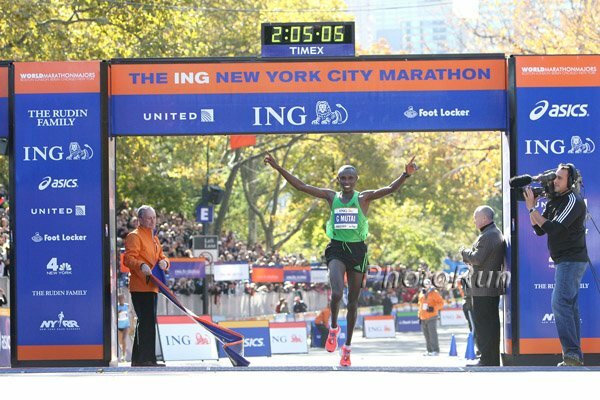 LRC 2013 New York City Marathon Men's Preview: Can Course Record Holder Geoffrey Mutai Hold Off Olympic Champ Stephen Kiprotich And London Champ Tsegaye Kebede? Next Sunday, distance fans will see their the 728 days of waiting for the great marathon that takes place the first Sunday in November in the Big Apple come to an end with a mesmerizing men's race that features the fastest man in history Geoffrey Mutai, London champ Tsegaye Kebede, World and Olympic champion Stephen Kiprotich, five-time WMM champ Martin Lel, and others. What about Meb Keflezighi, Jason Hartmann, Ryan Vail, Jeffrey Eggleston and the Americans? Recommended Read: Great NY Times Feature on NY's West Side Runners: Marathon as Melting Pot - Striving Immigrants Find Long Distance Running Far From Lonely in NYC Feeling proud of yourself for doubling? Did you do your first run at 4:30 am before working all day as a plumber? Kenyans Nixon Kipkoech Machichim And Mercy Jerotich Kibarus Win Venice Marathon Machichim won in a sprint finish, beating Raymond Kandie by 1 second in 2:13:10. Italy's Euro XC champ Andrea Lalli made his marathon debut in 2:14:16. Kibarus won the women's race easily in 2:31:14. Ethiopia's Mule Wasihum Aand Kenya's Josephine Chepkoech Win Tactical Races At Marseillle-Cassis 20K Wasihum won in 1:00:09, outkicking Cyprian Kotut (1:01:11) as the top 4 finished within 13 seconds of each other. Chepkoech won in 1:10:03, beating out Cynthia Jerotich (1:10:05). Caroline Chepkwony Wins Ljubljana Marathon In 2:27:27 Mulugeta Wami won the men's race in 2:10:26, beating Deribe Robi by four seconds. Lolo Jones Makes US Bobsled Team For World Cup This brings her one step closer to making the US team for the 2014 Winter Games. US gold medalist sprinter Lauryn Williams also made the World Cup team. German Fernandez 3rd In Portland XC Race Alan Webb's wife Julia (2nd) and Kara Goucher (4th) were in the women's race. The Only Sub-2 Hour Marathon You'll Live To See: 50,000 Children From 60 Countries Around The World Participate In Save The Children World Marathon Relay Challenge Students at schools try to challenge the marathon WRs by Wilson Kipsang and Paula Radcliffe, running the distance in 200m relay segments. The fastest 13 and younger team ran 1:51:39 and there was an adult/open section where a club team ran 1:42:22. Serbia's Surprise World Champs LJ Bronze Medalist Ivana Spanovic Hoping To Repeat Success At 2014 World Indoor Champs She set a NR in Moscow with 6.82m to get the bronze and his hoping for more of the same in 2014. New Zealand 63-Year-Old Grandmother Will Complete Her 100th Marathon Next Weekend In Auckland Apparently she'll be the 38th New Zealander to join the 100 marathon club. "I'm not a real runner," insists Charlotte Nasey. Interview With UK Heptathlete Katarina Johnson-Thompson She was 5th at Moscow World Champs. 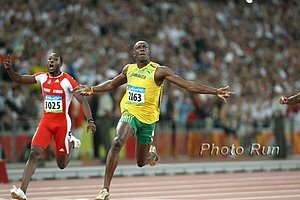 Yet Another Drug Debate: British Medical Journal: Should Athletes Be Allowed To Use Performance-Enhancing Drugs? Memo to morons who say "Yes" - do you want to turn all women into men? Denver Gorilla Run Is Saturday 1,500 runners in gorilla costumes to run. Going To Vegas And Want To Run? Hidden Running Treasures In Sin City We recommend going to Vegas immediately after your season ends and not running a step. Frankfurt: Vincent Kipruto (2:06:15) And Caroline Kilel (2:22:34) Win Windy Frankfurt Marathon Mark Kiptoo was a very close second in 2:06:16 as Flomena Chepchirchir (2:23:00) and Birhane Dibaba 2:23:01 were 2nd and 3rd for the women. Elite race coordinator Christoph Kopp said that he thought the race was 1:30 slower than it should have been on the men's side due to the conditions and "terrible" pacemakers. Marine Corps Marathon: Girma Bedada Wins Marine Corps Marathon By Over A Minute In 2:21:32 As Patrick Fernandez Was 2nd (2:22:52) US Army captain Kelly Calway won the women's race in 2:42:16 in what is one of the last things she'll do before deploying to Kuwait next week. Berlin Marathon Champ Florence Kiplagat Battles Strong Winds And Dominates Great South Run 10 Miler Winning By Almost 2 Minutes In 53:53 2012 10K World leader Emmanuel Bett won the men's race in 48:03 as SA's Stephen Mokoka was 48:22 and Uganda's Thomas Ayeko (who won the Great Birmingham Half last weekend) was back in 3rd (49:08). Kenneth Mung'ara (2:11:40) And Winfridah Kwamboka (2:33:18) Get The Wins At The Standard Chartered Nairobi International Marathon The women's race had some drama as another woman, Selina Ariong'onyang, initially crossed the line first but was later found to have cut the course. Ugandan Solomon Mutai won the accompanying half marathon in 1:02:55 as Corret Jepkoech won the women's in 1:11:52. World Speed Golf: Day 1: LRC Nick Willis In Sixth, Bernard Lagat In Last After Day 1 Of World Speed Golf Championships Bernard Lagat may be fast, but he's not a very good golfer as he put up a 118 in round 1. 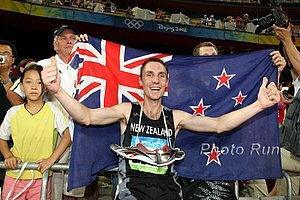 Nick Willis shot 86 in 44 minutes of play - but they weren't even the fastest runners in the field. *MB: Bernard Lagat and Nick Willis to play speed golf? Van Cortlandt Park Is Celebrating Its 100th Anniversary This Year And Gets NYTimes.com Profile The article says the course needs some work. Hasn't it been basiocally shut down for about 5 years? RRW With Broken Bone Healed, Sally Kipyego Ready To Return To Racing And Race For First Time In 2013 Kipyego will face Shalane Flanagan, Molly Huddle, Emily Infeld and others next weekend in the NYRR Dash to the Finish 5-K.
As We Get Closer To Winter, World's Top Athletes Turn Their Focus To World Indoor Champs In Sopot, Poland This March Among athletes who've confirmed their intention to compete is Mohammed Aman, who will defend his title from 2012. TJ World Champ Teddy Tamgho Also Confirms He Will Compete At 2014 World Indoor Champs Tamgho is the WR holder indoors. GB Sprint Phenom Adam Gemili Leaves Coach Who Got Him To A Sub-20 200 To Work With Sub-10 Man James Dasaolu And His Coach Gemili hopes that training with Dasaolu will help him improve. Canada's 2003 IAAF World Championships 100 Hurdles Gold Medalist Perdita Felicien Has Retired She is the Canadian NR holder and represented them at all 6 World Championships between 2001 and 2011 (as well as the 2000 and 2004 Olympics). Australian Athletes Will Be Banned From Drinking Alcohol In The Olympic Village During Rio 2016 And Even On The Flight Home This is in direct response to the controversies the team experienced at London 2012. AW Preview Of This Weekend's UK Cross Challenge: £30,000 Total Prize Money On The Line 1:05 half marathoner Dewi Griffiths leads the men's field. Huffington Post Blogger Claims "There is nothing more fashionable these days than attacking the NCAA." Are people too harsh on the NCAA? Jamaica Anti-Doping Commission Appoints New Executive Director Ahead Of WADA Audit Carey Brown is unlikely to play a big role in the WADA visit, though, since he is currently on jury duty so won't start right away. Athletics Kenya Vice President David Okeyo Speaks Out On Doping And Says Kenyans Have Nothing To Hide He says their organization is taking the fight against doping very seriously and claims most Kenyans accidentally dope do to ignorance rather than intentional cheating. LRC 2013 Ivy League Men's Cross-Country Preview: Will Columbia Hold Off Princeton, Which Is Looking For Its Fourth Straight Title? Since there is little action going on this weekend, we thought we'd preview the conference we know best. Are you interested in previewing your favorite conference? Email us. LRC 2013 Ivy League Women's Cross-Country Preview: Can Dartmouth And D'Agostino Stop Cornell From Three-Peating? Kenyan Liliane Jelagat Gets 2-Year Doping Ban Jelagat tested positive for EPO at the Appingedam 10K road race, which she won in 31:54. Good Read: Blog From Irish Olympic Steeplechaser Roisin McGettigan: "The Professional State Of Mind. A Letter To Aspiring Pros." McGettigan analyzes the mental approach you should be taking towards your running and what she says is relevant to runners at any level. LRC Meet America's Two Super Frosh, Super Seniors, Jordan Hasay Versus Emily Infeld, Abbey D. And Kennedy K., Mick Byrne And More Last week, midterms were held for NCAA XC and we break it all down for you with praise for Mick Byrne, Ben Saarel, Sean McGorty and others. We start to think about who is going to win $500,000 in New York next week. Plus if you could coach one runner, Emily Infeld or Jordan Hasay, who would you choose?